Eagle. 3" high x 1 3/4" wide 7/16" deep. Stamped steel case. Brass shackle. "PATENTED JAN.31.99" is stamped on the obverse of the shackle. 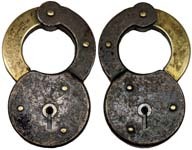 Some locks have "PATENTED MCH.15.98" stamped on the obverse of the shackle. Mfg by: Russell & Erwin Mfg. Co. Henry G. Voight Patent #'s 600627 618487. "EAGLE LOCK CO TERRYVILLE.....". 2" wide. Steel case. Steel Shackle. Mfg by: Eagle Lock Co.
"EAGLE LOCK CO TERRYVILLE....". 3/4" wide. Steel case. Steel Shackle. Mfg by: Eagle Lock Co.
"EAGLE LOCK CO TERRYVILLE....". 3" high x 1 1/2" wide. Steel case. Brass Shackle. Mfg by: Eagle Lock Co.
"EAGLE LOCK CO TERRYVILLE...." - "PAT.MCH.3.1896". 3.85" high x 2.42" wide x .460" deep. Steel case. 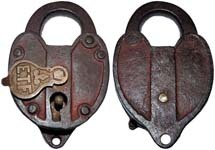 Laminated steel shackle. The reverse of the case is blank. 4 Levers. The patent shows 1 lever with 1 guard lever. We have not found a lock that matches the patent as yet. Mfg by: Eagle Lock Co. US Patent #555728. The Prototype is here. "EAGLE LOCK CO TERRYVILLE.... PAT. MARCH 24, 1903". 3 1/2" high x 2" wide x 3/8" deep. Steel case. Steel Shackle. Mfg by: Eagle Lock Co. US Patent #723549 US Patent #723550 US Patent #723551. "ELK". 3 3/4" high x 2 1/4" wide. Stamped steel case. Steel Shackle. The reverse of the lock is blank. "E. L. CO.". 5/8" wide. Steel case. Steel Shackle. Mfg by: Eagle Lock Co.
"ELECTRIC CITY". 2 1/2" wide. Stamped steel case. Steel Shackle. "ETON". 1 7/8" wide. Stamped steel case. Steel Shackle. Mfg by: Eagle Lock Co.